Duluth, GA (April 18, 2018) — On April 10, Georgia Gov. Nathan Deal issued a proclamation announcing April as Georgia Safe Digging Month. The proclamation reminds Georgia homeowners to contact 811 before starting any outdoor digging projects. Many stakeholders came out to the Capitol to receive Gov. Deal’s signed proclamation including Public Service Commissioners Lauren “Bubba” McDonald and Tricia Pridemore. As April marks the start of the spring digging season, Georgia 811 and Gov. Deal are encouraging homeowners to contact 811 online or by phone before they dig to prevent injuries, property damage and inconvenient outages. Every nine minutes an underground utility line is damaged because someone decided to dig without first calling 811. When calling 811, homeowners are connected to Georgia 811; which notifies the appropriate utility companies of the intent to dig. Professional locators are then sent to the requested digging site to mark the approximate locations of underground lines with flags or spray paint. Once lines have been accurately marked, digging can begin around marked lines. Striking a single line can cause injury, repair costs, fines and inconvenient outages. Every digging project, no matter how large or small, necessitates contacting 811. Installing a mailbox, putting in a fence, building a deck and laying a patio are all examples of digging projects that need a call to 811 before starting. Visit Georgia811.com for more information about 811 and the call-before-you-dig process. 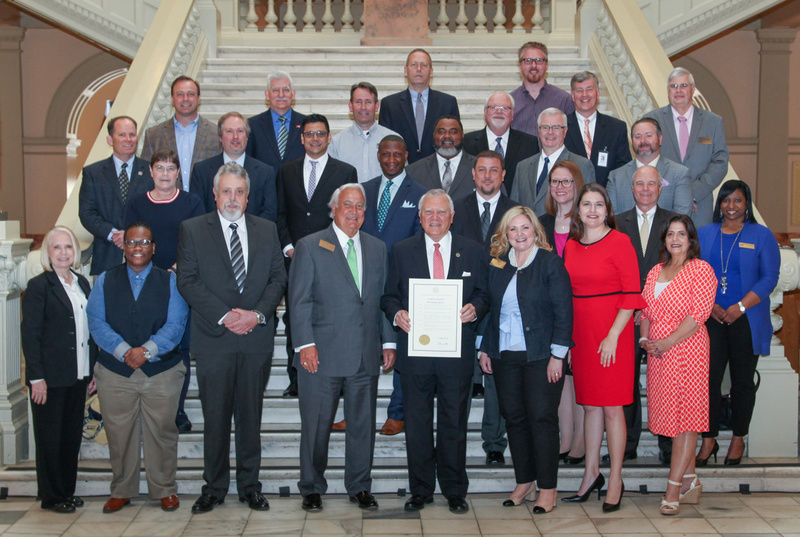 On Tuesday, April 10, 2018 Safe Digging Stakeholders gathered at our state’s capitol to recognize April as Safe Digging Month in Georgia with Governor Nathan Deal.